A Green Future For Beeston? Thanks to everyone for their attendance at Friday’s meeting, such a good turnout with over a 100 people. 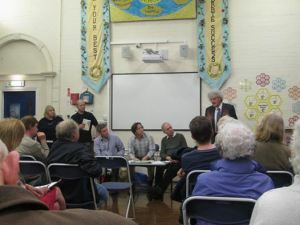 Matt Gould’s blog post about the meeting, shown here, is a good account and we share his view – we need everyone’s input to make this happen. So, please do reply to the post with thoughts and opinion, and we’ll keep you informed of Continuum meetings! Beeston & District Civic Society. PS, voting for the phase 1 improvements ends 30th June, so make sure you’ve voted! Friday night, and instead of heading straight from work to the pub, a load of you came down to the Civic Society extra meeting, where myself and other members of the Continuum Beeston steering group announced our findings and thoughts. L-R: Judy Sleath, Chair of Beeston and District Civic Society; Owen Rees, Civic Society Web Manager; John Delaney, Head of Built Environment, Broxtowe Borough Council; me; Nick Palmer; Professor Martyn Poliakoff. The most significant element of the meeting was the proposal put forward by Professor Martyn Poliakoff, who as well as being a extraordinary scientist, member of the Royal Society and Youtube star, is a proud Beestonian, raising a family here, his kids even attending the same school we held the meeting in.